Hand & Eye, founded by Phil Abel in 1985, is a London-based printer of books, posters, invitations and stationery. Hand & Eye can hand set letters in the Gutenberg manner of movable type for small print jobs, like invitations, but also use hot-metal typesetting using the Monotype system for larger jobs. 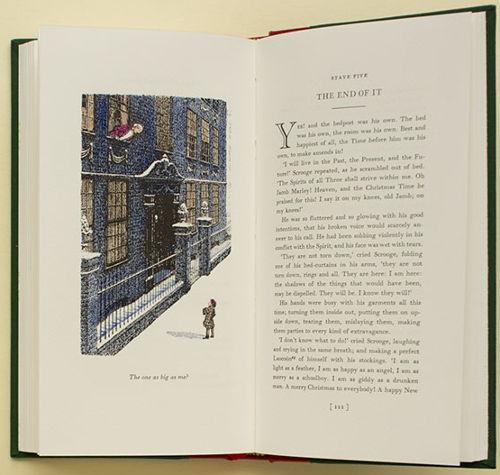 You will be duly, and festively, impressed by their own special edition of Dickens' A Christmas Carol, with twenty-five illustrations by Angela Barrett some of which are hand coloured by the artist. The beautiful special edition (right below and above) uses a Monotype Walbaum and Old Face Open typesetting and Somerset Book printing paper — an archival-quality paper made from cotton by St Cuthbert's Mill in Wells, Somerset. 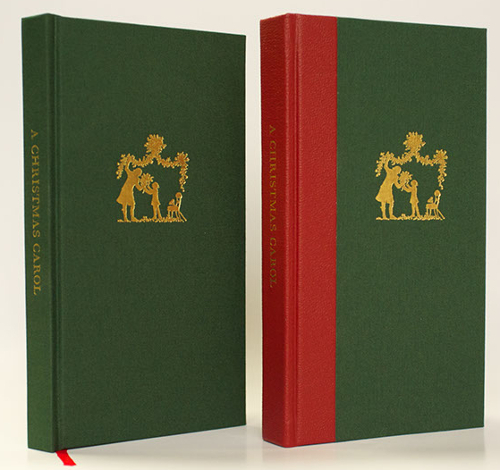 The book is bound in green book cloth with a red leather spine. This a book for your top shelf of top-notch tomes that will be handed on to the future generations of yourself, which is an awful lot nicer than handing over the login details for your Kindle purchases. They will thank you for your perspicacity. Interested in the cotton paper produced in Wells? I think we all are. St Cuthbert's Mill has been making paper in the small but perfectly formed city of Wells since the 1700s. Somerset Book is intended for limited edition prints. Available in four finishes (book, satin, velvet and textured), the paper has 'superior surface stability' for printing and is manufactured to 'last for hundreds of years (in good storage conditions) and won’t discolour or fall apart'. We try to feature only things that are made to last on The Tweed Pig, but the paper made by St Cuthberts Mill probably takes the prize in terms of longevity. If I gave it some thought, there might be others in contention, but you get the drift.